Implants: As stated by the American Dental Association, nothing can take the place of a healthy set of natural teeth. However, when disease or an accident ends in tooth loss, it’s comforting to know there are options for restoring your smile. Implants are posts that are surgically placed in the upper or lower jaw, where they function as a sturdy anchor for replacement teeth. They are made of titanium, a strong, lightweight metal. Dental implants can be used for single tooth replacement or as an option to secure dentures. 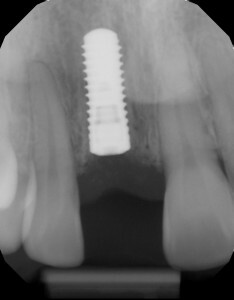 X-ray of what a dental implant looks like. 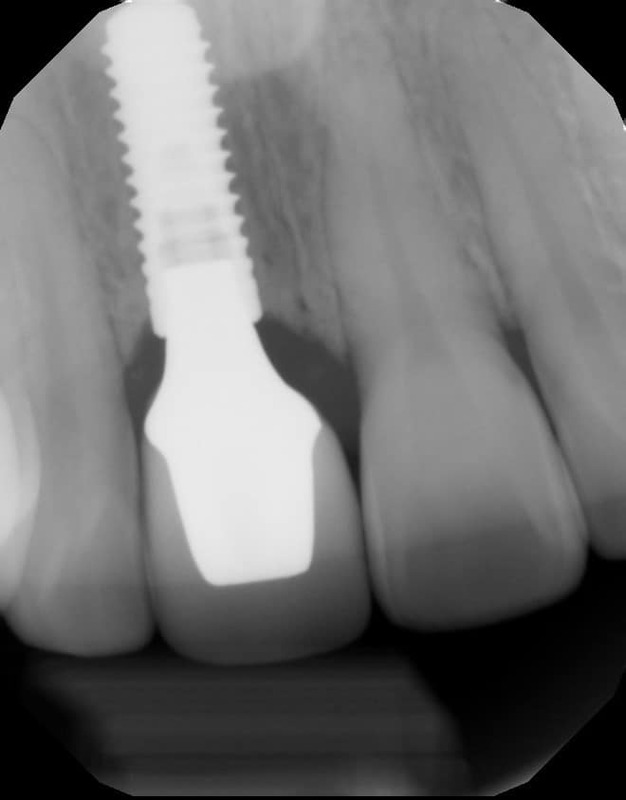 The first step for treatment is to remove the existing tooth (if necessary) and place the titanium implant in the bone. This implant will remain covered under the gum for approximately 6 months. During this time the implant will fuse to the bone. 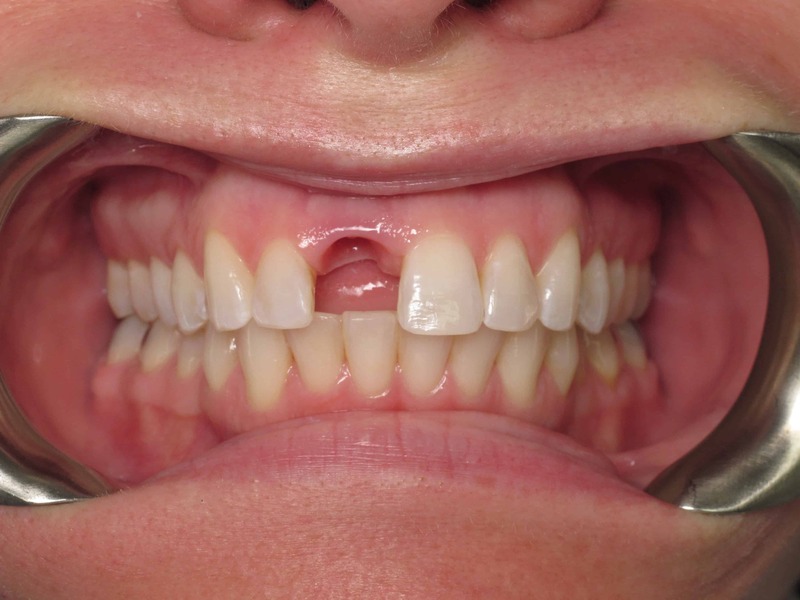 If the placement site is a front tooth, your dentist will likely provide you with a flipper (a temporary partial denture) so that you are not “missing” a tooth during the healing process. In the second step of treatment, the implant is uncovered and a post is attached to the implant; completing the foundation for the new tooth. In the final step of treatment, your new tooth is attached to the foundation, and your dental implant is complete. 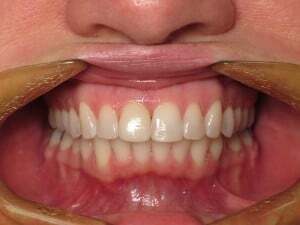 New techniques allow your dentist to ensure that the size, shape, color, and fit of you new tooth matches your natural teeth. Implants are not an option for everyone. If you are considering an implant as a tooth replacement option, you should consult your dentist and be medically evaluated before implant surgery is scheduled. My name is Jennifer, and I am a Licensed Dental Assistant who experienced a childhood injury that left my smile looking unnatural. A dental implant was recommended to treat my front tooth, and even as a dental professional the thought of going through this process was extremely difficult. My anxiety stemmed mostly from knowing that I needed to have a front tooth removed. Now that I have completed my treatment, I would like to share what a positive experience I had. I am hoping to help alleviate potential fears for other implant patients. From my first consultation to the completion of my dental implant, my dental team worked side by side with the oral surgeon to ensure a smooth transition from one step to the next. They kept me involved and educated throughout the entire process. The procedures were comfortable, the temporary appliance look natural, and the end result was perfect. My tooth looks and feels like a natural tooth! Jennifer’s smile before she got her dental implant. You can see her permanent crown looks different from the rest of her teeth and there is some discoloration in her gum above the tooth. Jennifer’s smile after her existing tooth was removed. Jennifer was provided with a temporary appliance that she wore during the healing process, so that she was not missing a tooth. 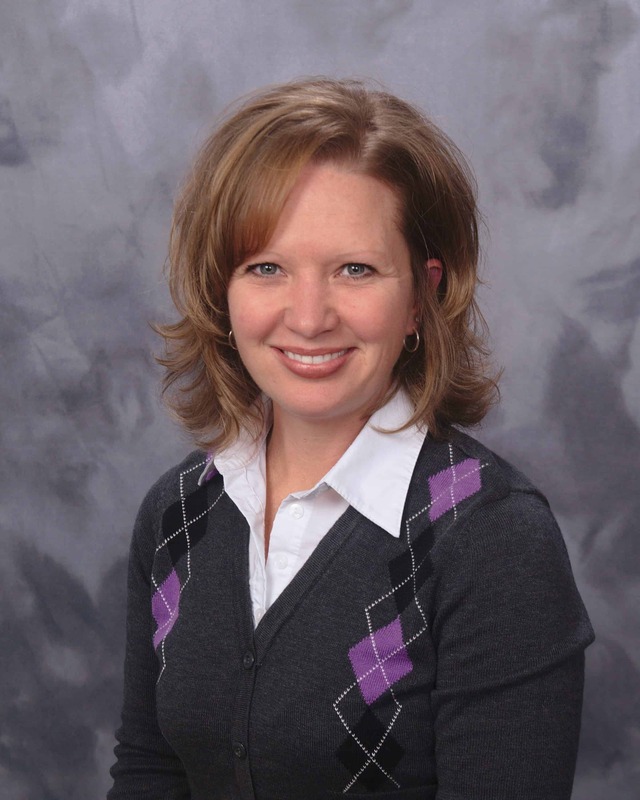 Jennifer’s new smile after her dental implant was completed. Her new tooth’s texture, size, shape, and color match her other teeth, leaving her new smile looking natural! If you think a dental implant may be an option for you, ask us for an appointment today, or find out more about your options in our video here! I have the very same problem. My front tooth (ceramic crown) is almost identical to hers! But my permanent crown has a very bad smell and also like hers, my gum is darkened around the crown and above. My question is, when you put her implant did you lighten her gum or the final result as showed in the final picture was natural and the gum lightened with time? I checked with Dr. Peters, he said it depends. 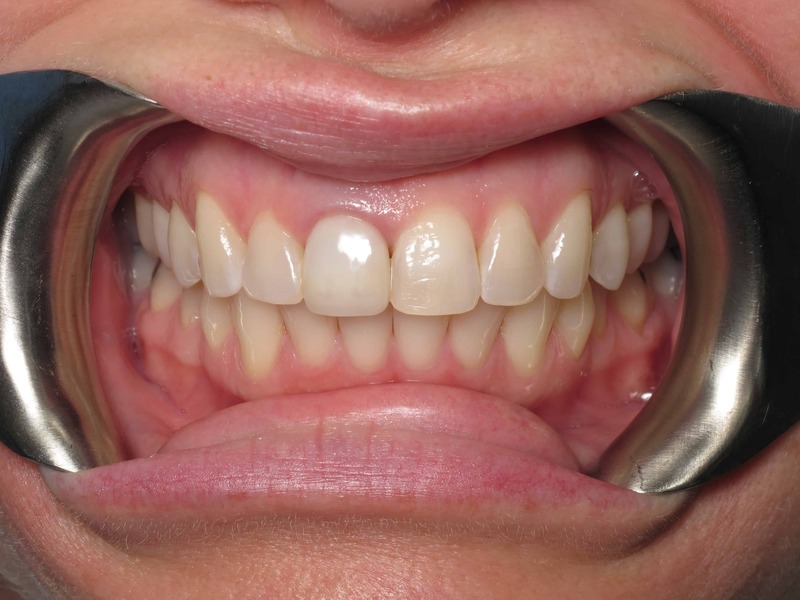 Most times when older dental crowns are replaced with newer all ceramic ones, the darkness is removed. However, if some of the darkness is coming from the actual root of the tooth, then some may remain in the gums, but usually this can be hid deeper beneath the gums. In the before and after photo on the blog, no gum modifications were performed. He also said he’d love to see your teeth in person to know for sure. He offered to do a complimentary consult if you’d like to learn what your options are. Please feel free to give us a call at 507-288-1188! Hi Jen! I hope your experience at the oral surgeons went well! If you have not found the answer to your question so far, you should be able to go through the whole process without being “toothless.” You are correct that the flipper can be adjusted, and it is understandable that you may be worried about this process because it is a front tooth. When you get to the final crown restoration, even then, they can put a temporary crown on the implant to keep you from being toothless!